How do you stop a dog fight? No really: how do you stop a dog fight? 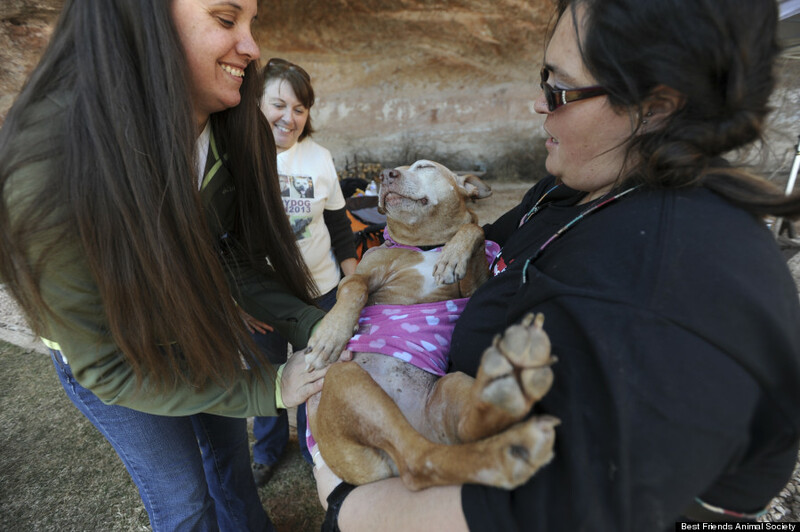 But animal welfare groups like the ASPCA estimate that tens of thousands of people are involved with dogfighting -- and that the activity may not only be growing, but going deeper underground. The Humane Society and other organizations offer reward money for information leading to the arrest of those who are involved with dog fighting operations. Which leads to the question: What does a dog fighting operation look like, and how will you know if you're seeing the signs? And if you do come across what you suspect is a dog fighting operation, what should you do next? We got answers from Scotlund Haisley, who has more experience with dog fighting than he'd like. In the 25 years since he began working in animal protection, Haisley has been a part of dozens of dog fighting rescue operations. He helped lead a 2009 multi-state bust that rescued more than 400 dogs, and also helped oversee the care of 11 of the most behaviorally and physically injured dogs rescued from Michael Vick's Bad News Kennels. As founder of the Animal Rescue Corps, Haisley's regularly involved with investigating and rescuing animals from dog fighting operations. He started by telling HuffPost where those operations are likely to be found. The Huffington Post: Where does dog fighting happen? Scotlund Haisley: Dog fighting is a serious problem in both urban and rural areas across the U.S. and throughout the world. Based on reports of dog fighting and evidence found on local and state levels, it is estimated that there are tens of thousands of organized dog fighters and hundreds of thousands of street dog fighters. It is also estimated that tens of thousands of dogs die every year as a result of dog fighting. Most dog fighting operations are well hidden and are often found unexpectedly by authorities during drug busts. But people should educate themselves on signs that suggest dog fighting activity and should report this to animal control, local law enforcement, Animal Rescue Corps or another organization that directly addresses dog fighting through the criminal justice system. What will you see at a dog fighting operation? Is there anything else that would indicate a dog fighting operation to a layperson? The typical rural organized dog fighting operations have as few as a half dozen to several dozens of scarred, wounded, intact, 35 to 50-pound pit bull type dogs, all staked to the ground on thick, heavy tow or logging chains approximately eight feet in length. The dogs wear perfect dirt circles in the ground the length of the chain, and there are just inches between each circle so that the dogs are close but far enough that they don’t make contact with one another. 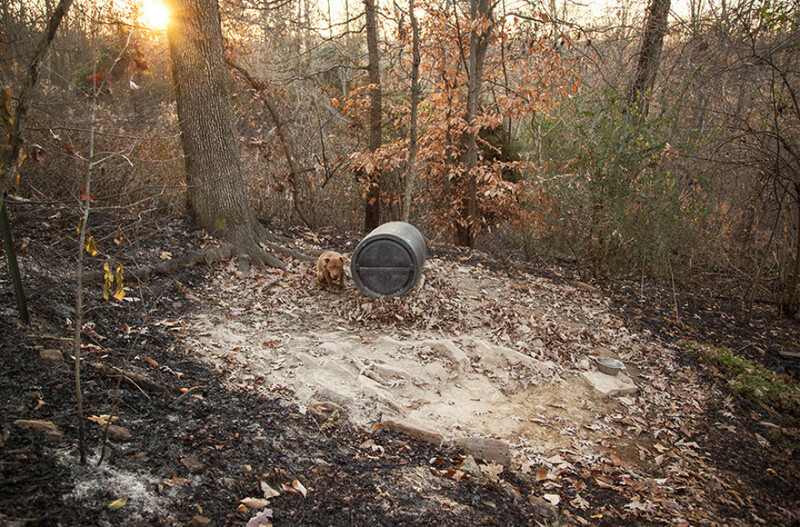 If they have shelter at all, it is usually a 55-gallon chemical barrel with the lid cut off and turned on its side or it’s a dilapidated doghouse. If there is any food or water at all, it is typically algae and/or maggot infested and contained in a heavy, sometimes concrete, bowl or five-gallon bucket. On these properties are other implements of dog fighting, including: tread mills; sparring rings (small, usually carpeted chain link enclosures used for practice matches); spring poles; ropes generally hung from trees, that the dogs are trained to jump, grasp and hang from to condition them for fighting; break sticks used to separate a dog’s biting jaws; drugs such as steroids to artificially strengthen the dogs; dog fighting publications/journals and burn piles with the remains of dogs, likely those who were killed in a fight or killed by the dog fighter because they were considered useless. In cities, where there isn’t the space or privacy to hide from law enforcement, the dogs are often kept in basements or abandoned buildings on the same type of tow or logging chains but attached to radiators or structural beams. Typically, the actual dog fights don’t occur where the dogs are bred, kept and conditioned and trained to fight. The dog fighting arena is typically in a warehouse, barn or other large structure in a remote location large enough to hold an audience attending the fights as well as the actual fighting pit –- typically square enclosures 12-24 square feet and two to four feet high made of plywood, chain link or bales of straw. “Scratch lines” are drawn in opposing corners where the dogs are held until released to fight. 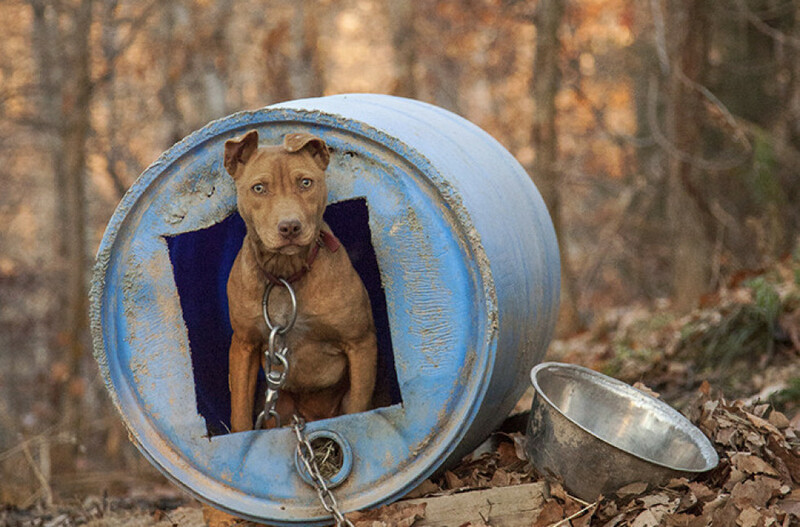 The major dog fighting busts have been in the midwest and the south. Do you think that happens to be where the busts have taken place, or it's where most of the operations are actually located? Dog fighting, like any type of animal cruelty, exists throughout the U.S. The perpetrators of illegal animal cruelty most commonly conduct their activities in rural areas that have limited law enforcement resources to address such cases. What should someone do if they come across what they suspect is a dog fighting operation? If someone sees signs that suggest dog fighting activity, they should immediately report the property to animal control, local law enforcement, Animal Rescue Corps or another organization that directly addresses dog fighting [like the ASPCA or the Humane Society of the United States]. What is the difference between organized dog fighting operations and street fighting? Organized dog fighting is a massive network of individuals engaged in the practice of misdemeanor and felony animal cruelty, illegal gambling and oftentimes other criminal activities that come together for pre-planned dog fights where the stakes are high. Street dog fighting is very different in that the decision to fight the dogs is typically spontaneous. The dogs are still usually pit bull type dogs but aren’t necessarily bred, conditioned and trained to fight. It’s often done late into the night in a school yard, park or garage and the stakes aren’t as high as organized dog fighting -– oftentimes there is no money exchanged; the winnings are street cred. Whether it is organized or street fighting, it is animal torture and a felony offense. Are dogs used in dog fighting friendly? Can they be family dogs, after their rescues? Victims of cruelty are affected in different ways, but dogs are incredibly resilient animals and it is possible for them to adapt to life as a family member. This is Little Red, who spent five years as a "bait dog" at Michael Vick's Bad Newz Kennels. Check out more photos of former Vick dogs who are now beloved family pets. Generally, dogs used for fighting are friendly to humans, even those responsible for abusing and torturing them. Their gentle and eager-to-please nature is manipulated and exploited -– they are bred, conditioned and trained to kill other dogs, not people. Some dogs rescued from fighting situations do not display aggression towards other dogs either, but extensive assessments are needed to determine appropriate placement for each individual animal. Survivors of dog fighting require extensive rehabilitation prior to being placed in an adoptive home with a family or other animals. This requires Animal Rescue Corps, and any other organization that rescues dogs from fighting operations, to have a network of partners in place able to receive and continue to medically and behaviorally rehabilitate these dogs immediately after custody is awarded. While some of these dogs are emotionally and physically ready for adoption sooner, it can take months, or even years, under the rehabilitative care of experienced individuals before they are fully ready to reclaim their lives in a forever home. There are all-breed and breed-specific rescues and shelters across the country who have survivors rescued from dog fighting available for adoption. Animal Rescue Corps placed dogs from our 2012 case, "Operation Broken Chain," with nearly two dozen organizations across the country. The organizations with the resources to medically and behaviorally rehabilitate these victims of extreme abuse are few and far between, but they are of the highest quality and some of the most effective and dedicated rescuers there are. Mayday Pit Bull Rescue & Advocacy in Phoenix, Arizona, is of particular note, focusing on dogs with special medical and behavioral needs. Mayday accepted four dogs from Operation Broken Chain into their program: Honor, Felicia, Eileen and Harpo. Upon his arrival at Mayday, Harpo was emaciated, traumatized, blind, covered in scars and had pressure sores from being constantly chained. His legs were badly damaged from past trauma, and his bones had never been surgically reset or repaired. He was also diagnosed with a severe MRSA infection, caused by staph bacteria, from his open wounds. Harpo has undergone three surgeries to repair the shattered and badly healed bones in his legs. Plates and screws were placed in his legs to reshape them and provide him stability where the damaged and infected bone was removed. Both legs were casted for several months and required weekly cast changes. When his casts finally came off, the improvement in his legs was dramatic -– he was able to walk and run without pain! Harpo has also overcome his MRSA infection after months of heavy dosage antibiotic treatments. Though he remains fearful in new situations, in part due to his blindness, he is a gentle and sweet soul who bonds closely when he gets to know you. Mayday has given Harpo the opportunity of new life. This survivor is currently available for adoption. Harpo is not yet listed on the group's website, but "he is available for adoption and will be posted soon," says Mayday's president Jennifer Mazzocchi. Yay, Harpo! Do you know an animal rescue group doing great work? Did you save a pit bull -- or did a pit bull save you? Tell us about your animal stories at arin.greenwood@huffingtonpost.com. Parts of this interview have been edited for length and clarity.